Ilderton offers many choices of housing from large family homes built over the last few years to century properties, farms, apartments and condominium retirement homes. Due to the short commute from nearby London the housing market is buoyant as people wish to leave the hustle of the city and move to a semi-rural environment with the small-town feel. Most new homes are custom built by local home building companies so they can tailor a home to your exact needs. There are also several local Realtors who specialise in resale homes in Ilderton and the surrounding area. See the links below or on the Business page. FSBO (For Sale By Owner) is also becoming increasingly popular. FSBO homes shown on Ilderton.ca are listed by the home owners and any information given is the responsibility of said homeowner/vendor. Click on the images below to visit a webpage giving further details of each home. And tell the vendor you saw it on Ilderton.ca! 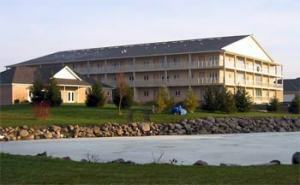 Located in the heart of Ilderton Ontario the 36-unit apartment complex is unlike any other. Lifestyle was the most important consideration when Vintage Green Apartments was planned for persons 55 and over. It’s unique design and theme are based upon apartments built around an immense atrium. The building, that has a European flair, is designed with three floors built above an underground parking garage. From the inside balconies, with its lovely glass railings, one looks up at forty skylights and a natural wood ceiling, which make the building light and spacious. The complex is tied in with the Vintage Green Homes that is a community within itself. Tenants have access to all the Clubhouse activities such as bridge, coffee mornings, exercise and wellness programs and much more. For further information please contact Wilma Van Bussel at 1-888-355-9955, 519-666-3651; 519-619-1337 or click on the photo to visit our website.